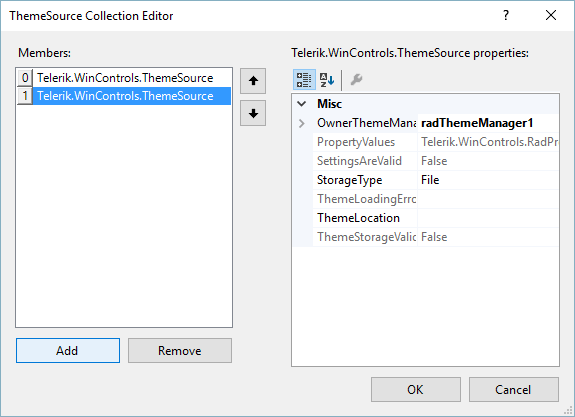 Select Edit Themes to open the ThemeSource Collection Editor. Click OK when you are finished working in the editor. Choose the StorageType for the theme. Select Resource or File. Set the ThemeLocation (resource name or file location). Select the theme that you wish to remove. Select the theme that you wish to edit. Set the StorageType and ThemeLocation properties to your desired values. When setting the ThemeLocation for a Resource storage type be sure to include the project namespace. The naming convention for ThemeManager to find the resource is <my project namespace>.<theme name>.xml. In project "MyProject" with theme resource file "MyTheme.xml", the fully qualified resource name should be entered as "MyProject.MyTheme.XML".